This article is about the theme. For the character, see Scooby-Doo (figure). Scooby-Doo is a licensed theme introduced in August 2015. The majority of the theme is based on the series Scooby-Doo, Where Are You?, but aspects from other series are included. Five sets will be introduced in the first wave. The majority of the sets are based off the show but have slight changes, mainly in the colour scheme. Every set comes with a hidden treasure and a monster, which when the mask is removed, reveils the disguised person inside. Like Friends the theme introduces new rubberish hairpieces, for the human members of the gang. Like the sets characters are all based off their appearance in Scooby-Doo where are you?. Scooby-Doo and Shaggy Rogers appear in every set and Daphne Blake appears in two, everyone else is exclusive to the set they appear in. There was at least two 22 minute (the same length as the majority of the original show's episodes) direct to video movies, one set released in 2015, others to be released in the coming years. The sets follow the gang trying to capture monsters. 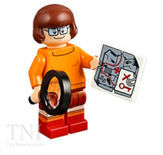 LEGO Scooby-Doo Products Fans will instantly recognize all of their favorite Scooby-Doo characters and icons, including Scooby, Shaggy, Fred, Daphne, Velma and the Mystery Machine, as well as all the ghosts, goblins and other villains that make Scooby-Doo adventures complete in sets such as the Mummy Museum Mystery, the Haunted Lighthouse and the Mystery Mansion. LEGO Scooby-Doo products range from $14.99 to $89.99 (USD) and will be available in toy stores nationwide beginning in August. About Scooby-Doo Scooby-Doo is one of the few classic properties to maintain top on-air ratings across the globe and is consistently ranked as one of the top properties in the Warner Bros. Consumer Products licensing portfolio. Scooby-Doo is the only dog with human characteristics who can live and play in a kid’s real and imaginative world. Scooby loves to solve mysteries, is hip and cool and makes ‘spooky’ fun; he truly is the dog that can Doo it all! Scooby-Doo is one of the few classic properties to maintain top on-air ratings across the globe and is consistently ranked as one of the top properties in the Warner Bros. Consumer Products licensing portfolio. Scooby-Doo is the only dog with human characteristics who can live and play in a kid’s real and imaginative world. Scooby loves to solve mysteries, is hip and cool and makes ‘spooky’ fun; he truly is the dog that can Doo it all! This page was last edited on 28 March 2018, at 21:12.